The Efco TT163 Consaw is designed specifically for professional users. 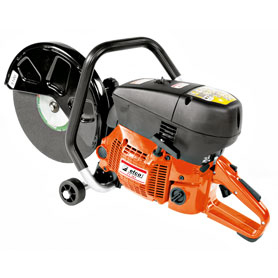 It's a powerful tool for cutting asphalt, concrete and metals. These machines are equipped with every available leading edge solution able to guarantee high performance, long-term reliability and maximum operator comfort. Consaws can be used with a trolley, which gives added stability and helps to ensure a more accurate result, for example, when the cut needs to follow a straight line. Suitably proportioned filter systems designed especially to protect the engine even in the most hostile and dust-laden environments. Ergonomically designed with all main controls readily accessible. Featuring a reversible cutting arm for improved access and a Fitlering system comprises 3-layer sponge prefilter, plus paper and nylon-mesh filters for unrivalled performance under all conditions. Electronic speed governor on coil and a cylinder with decompressor guarantees less stressful starting. Silicone-coated starting cord prevents swelling caused by water, fuel tank protected against sparks and accidental knocks. This machine is supplied without disc.